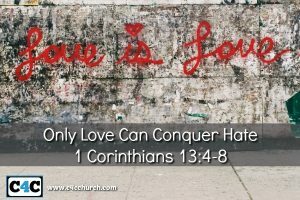 Only Love Can Conquer Hate | Champions 4 Christ Inc.
We live in a society where we have put many labels on many things. We call things what is, what’s not. We call things what’s not what is. We wonder what is going on in our world today. We are living in a society that”s full of racial injustice, racial profiling, classism, sexism, elitism, ageism and ableism. I believe all the isms of our society can be summed up in three letters “SIN”. We have all sinned and fallen short of the glory of God. When I was working on my doctorate one of my professor Dr. Ronald Hawkins would often say that “We are profoundly fallen people living in a profoundly fallen world”. Sin gives life to hate. Hate is a formidable opponent with a history of success. Hate can camouflage itself, hate can be deceptive, hate can be unforgiving, hate can be long lasting, hate can be unreasonable and intolerant. There are many armies who has fought hate with many weapons of all sizes to only realize they were no match. Hate is too big, too strong, too powerful and the only weakness hate has that it can’t defeat is Love.